This is a personal and independent website/blog with ideas and suggestions for things to do in and around Coffs Harbour (NSW) on the East Coast of Australia. All stories are written by Micky Stuivenberg. I only write about activities and attractions that I have personally experienced so I can give you honest reviews and first-hand impressions. Scroll down the homepage for the most recent reviews. Narrow it down to a main category (OUTDOOR — INDOOR — FREE activities). Pick a specific topic from the tag cloud in the sidebar on the right. Search this blog using the search box on the right. Enjoy your discovery of Coffs Harbour activities. If there’s a blog post you really like, please use the social media buttons to share it with your friends. Thanks! This entry was posted in General information on 21 January 2011 by Micky. Boambee Creek Reserve in Sawtell (just a 10-minute drive from Coffs Harbour), is a picture-perfect bay with calm, clear water, pretty beaches, a gorgeous deep-green backdrop of trees and plenty of fish. It’s the ideal Coffs Coast spot to go swimming, fishing, kayaking or canoeing. Going kayaking on this beautiful creek has been high on my list of things I want to do in Coffs Harbour, yet for some reason I’d never got around to doing it until now. To be fair, kayaking in Sawtell wasn’t that easy to organise until 2012, when Matthew Sparrius set up his C-Change Adventures kayak hire & tours business at Boambee Creek Reserve. Now it’s easy to drive down, hire a single or double kayak, step in and paddle away. Within minutes you’re surrounded by nothing but nature. And there’s a lot to explore: the creek is very wide and goes several kilometres inland. This entry was posted in Outdoor Activities and tagged $15-$30, birds, cafés, fish, nature, sawtell, sports, swimming, views, wildlife on 16 March 2014 by Micky. Stand-up paddle boarding, or SUP, is a reasonably new activity (or sport, if you’re really into it) that has quickly become very popular around Australia. It’s really catching on here on the Coffs Coast, too. I remember the first time I saw people standing up on a board with a long paddle in their hands – and that was only a few years ago. At that time, you couldn’t hire SUPs anywhere in Coffs Harbour. How things have changed. 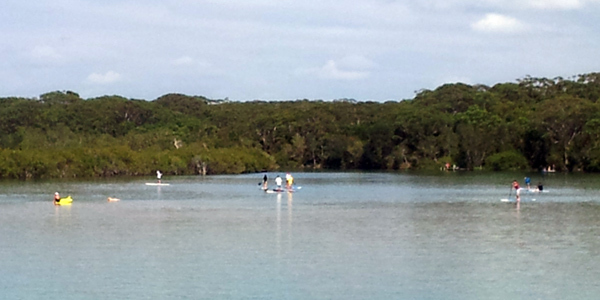 At the time I’m writing this (January 2014) there are at least 3 SUP hire businesses in and around Coffs Harbour. I’ve been very keen to give SUP a try, and I’m glad I finally did. I loved it! Because I’m not that confident in the ocean, and wasn’t sure how difficult stand-up paddleboarding would be, I decided to start my adventure in easy conditions close to my home: on Coffs Creek. This entry was posted in Outdoor Activities and tagged $15-$30, beach, coffs harbour, creek, jetty, nature, sports, views, water activities on 11 January 2014 by Micky. A visit to the lush rainforest at Dorrigo National Park should be on everyone’s itinerary when they’re staying in Coffs Harbour. Dorrigo National Park is only 65km (1 hour by car) from the heart of Coffs via the scenic Waterfall Way, which starts to climb up Dorrigo Mountain after you’ve passed through Bellingen (very much worth a visit in its own right). I always take visitors on a day trip to this national park, as it’s sure to make an impression on both Australian and overseas visitors. The scenery at Dorrigo National Park is stunning and there are some very accessible walks that I recommend doing. This entry was posted in Outdoor Activities, Things to do for Free and tagged art, birds, cafés, dorrigo, food, nature, scenic drive, views, walks, waterfalls, wildlife on 17 March 2013 by Micky. Ride a Segway – Fun & Different! Most of my blog posts are about walks, views, wildlife and other free and easy activities around Coffs Harbour. But here’s something completely different: Segway tours. When I was given an opportunity to join a Segway tour, I didn’t have to think twice. I’ve always wanted to try riding a Segway. They just look like so much fun, don’t they? If you’re like me and you’d love to ride a Segway, learn to navigate obstacles, see how fast you can go and make your way up and down hills – all while enjoying great views, read on. This entry was posted in Outdoor Activities and tagged $15-$30, $60-$80, coffs harbour, fun, rides on 28 December 2011 by Micky. The Bellingen Community Markets, held monthly (on the third Saturday of each month), are the biggest and the best markets in the Coffs Harbour region, probably in Northern NSW as well, and perhaps even in Australia. With around 250 stalls set up all around leafy Bellingen Park, you can spend hours at the market, which has such a good atmosphere and live music and performances that it feels less like a normal market but more like a festival that you get to enjoy every month. Of course, Bellingen is known for its laid-back character, interesting locals and alternative lifestyles. This adds to the lovely, casual ambience you’ll find anywhere around the town and at the markets as well (cue massage tents and tarot reading stalls). This entry was posted in Outdoor Activities, Things to do for Free and tagged art, bellingen, events, festivals, food, fun, markets, music, what's on on 20 February 2011 by Micky. Did you know you can go ice skating in subtropical Coffs Harbour? And if you knew, have you ever tried it? I’ve known there was an indoor ice rink at The Big Banana ever since I moved here, and I’ve always been keen to try it out, but for some reason I’ve only recently put on those skates – and I loved it. I was afraid it would be a tiny ice rink but it was actually bigger than expected. I’ve been to an indoor ice skating rink before where you all you could do was go around in tiny circles, but at the Coffs Harbour ice rink, you can actually pick up some decent speed on the straight stretches before having to turn the corner. This entry was posted in Indoor Activities and tagged $5-$15, coffs harbour, fun, sports, video footage on 19 January 2011 by Micky. Raining in Coffs Harbour? Stuck for things to do? In this blog post, I’ll list a bunch of wet weather ideas for the Coffs Harbour region. The Coffs Coast is a subtropical region and we do get our fair share of rain throughout the year. If you’d rather not tackle outdoor activities when it rains, or when it threatens to rain, don’t worry – Coffs Harbour has plenty of things to do on a rainy day. This entry was posted in Indoor Activities and tagged cinema, coffs harbour, fun, markets, movies, swimming on 6 November 2010 by Micky. 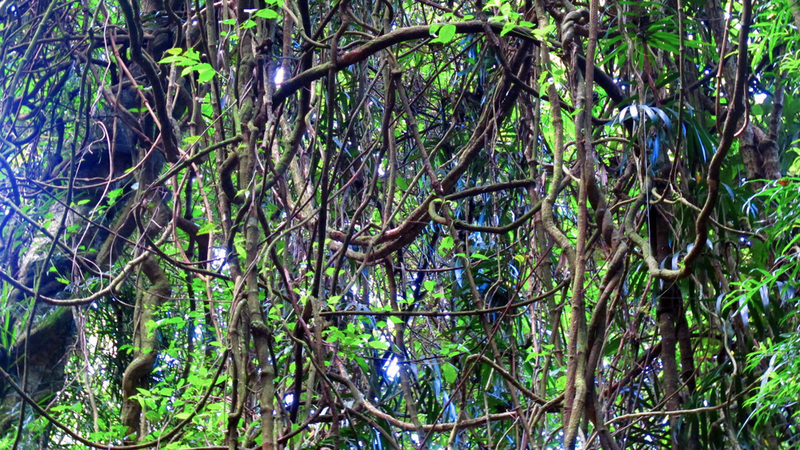 For a great walk in the rainforest only 5km from Coffs Harbour, you have to visit Bruxner Park Flora Reserve. In addition to several signposted walking trails, there is also a fantastic lookout point over all of Coffs Harbour – Sealy Lookout – at 310 metres above sea level. The walking tracks at Bruxner Park are only a 10-minute drive from the CBD, which make them the closest rainforest walks to the Coffs Harbour city centre. These bushwalks are so near and so easily accessible that you’ll have no excuse not to go there at least once. It’s amazing how many Coffs Harbour residents have never actually walked along these forest trails. This entry was posted in Outdoor Activities, Things to do for Free and tagged birds, coffs harbour, nature, scenic drive, views, walks, wildlife on 30 January 2010 by Micky. One of the most popular ‘eat streets’ in Coffs Harbour is what the locals call the ‘Jetty Strip’. What makes it so popular is the wide variety of restaurants and cafés to choose from and the laid-back vibe due to its proximity to the beach and harbour. There are so many choices that you can just go there and make a last-minute decision what and where you want to eat. Below is a complete list of all the eateries along and close to the Coffs Harbour Jetty Strip of restaurants. I’ve listed each of their specialties, their phone numbers and a link to their website, if they have one, or Facebook page. There are more than 20 cafés and restaurants all together in the one area. This entry was posted in General information, Indoor Activities, Outdoor Activities and tagged $15-$30, $30-$60, $5-$15, cafés, evening, food, jetty, restaurants on 29 December 2009 by Micky. Do you dive? If not, you can see what the underwater world of the Solitary Islands Marine Park looks like at the Solitary Islands Aquarium (formerly the National Marine Science Centre Aquarium) in Coffs Harbour. The Aquarium is normally open on Saturday and Sunday only, however it opens daily during NSW school holidays. It makes a nice brief outing for a rainy day on the weekend. Treat yourself and have lunch or coffee at Pacific Bay Resort afterwards – the aquarium is located right beside the resort, after all. This entry was posted in Indoor Activities and tagged $5-$15, coffs harbour, fish, fun, wildlife on 13 November 2009 by Micky. I love whale-watching season in Coffs Harbour! It makes all those walks over Muttonbird Island and any other headland and coastal lookout point that much more exciting! Will we see whales today? If so, how many? And will they merely spout some spray into the air to alert us to their presence, will we see their backs glide gently out of and back into the water, will there be some tails up in the air or are they putting on a full-on breaching and tail-flapping show for us? No matter how many times you’ve seen whales, because they’re so mighty and so unpredictable, every time you see one it’s exciting again. And it unites people, pointing them out to those who haven’t spotted them yet and going “oh” and “ah” and “wow” in unison. This entry was posted in Outdoor Activities, Things to do for Free and tagged coffs harbour, cruises, fun, nature, views, walks, whales, wildlife on 24 June 2009 by Micky. Cycling is becoming increasingly popular in and around Coffs Harbour. There are at least four bicycle shops in Coffs Harbour alone, various cycle groups and clubs and regular community rides and events. One popular cycle route is the cycle path along Hogbin Drive between Coffs Harbour and the neighbouring village of Sawtell. The cycleway is separated from the road by a nature strip so it’s a safe and relaxing ride. And Sawtell makes a fun destination. Just the stretch along Hogbin Drive is 6km, but if you go from the centre of Coffs Harbour to the centre of Sawtell it’s 10km. That’s a distance you can easily do in one hour (i.e. going a very leisurely 10km/hr). We enjoy meeting up with friends early on Sunday morning at the start of Hogbin Drive and riding to Sawtell to have breakfast before making our way back. This entry was posted in Outdoor Activities, Things to do for Free and tagged cafés, coffs harbour, cycling, fun, nature, sawtell, sports, views, whales on 1 May 2009 by Micky. This post gives people who want to travel from Sydney to Coffs Harbour a quick overview of their travel options. I’ll go over the various ways to get to Coffs Harbour from Sydney – by car, bus, coach via the Pacific Highway; by plane with Virgin Australia, Tiger Airways or Qantas flights; or by train with Countrylink. LATEST UPDATE: All prices are as found online on 25 March 2013 and may vary. They apply when pre-purchased, and are for one-way travel. Personally, I prefer flying. It’s quick and you can get good deals on air tickets if you keep an eye out for sales, that seem to be on almost all the time. I subscribe to Virgin Australia V-mail and Qantas Red as well as Tiger Latest Deals email newsletters that alert me when there’s a sale on. This entry was posted in General information and tagged coffs harbour, sydney, transport, travel on 5 April 2009 by Micky. A drive through Coffs Harbour’s countryside will soon make you realise this is ‘horse country’. If you would like to explore Coffs Harbour’s beautiful forests on horseback, you can. There are a number of places around Coffs where you can join a guided horse ride, even if you’re a beginner. I rode a horse for the very first time in my life a few years ago with Valery Trails at Bongil Bongil National Park, south of Coffs Harbour. Their gentle, well-behaved horses and friendly guides made this a very enjoyable experience. You can choose from a variety of different rides of various lengths and at different times of the day. This entry was posted in Outdoor Activities and tagged $30-$60, horse riding, nature, scenic drive, wildlife on 29 March 2009 by Micky. Coffs Harbour is so much more than beaches. Our hinterland is incredibly beautiful, tranquil and close by. I love driving through the Orara Valley and stopping the car wherever I want to enjoy the view and listen to the birds. A Saturday or Sunday morning or afternoon is ideal to head out west to Coramba, Upper Orara and Nana Glen. On Monday and Tuesday, you may find some shops or cafés closed, but the views will be equally beautiful. From the centre of Coffs Harbour, follow the signs to Coramba via West High Street and Coramba Road. The scenery becomes rural in just a few minutes, with banana plantations, avocado and fruit trees, wide open fields with cows and horses, and hills and valleys everywhere you look. This entry was posted in Outdoor Activities, Things to do for Free and tagged art, birds, cafés, coramba, nana glen, nature, scenic drive, views, wineries on 14 March 2009 by Micky. One of the best kept secrets of the Coffs Coast is Red Rock – a tiny but beautiful village half an hour north of Coffs Harbour. It is situated by the beach and along Red Rock/Corindi River, and borders Yuraygir National Park. If the weather is good, Red Rock is the perfect destination for a relaxing day out with your special someone or the whole family. This entry was posted in Outdoor Activities, Things to do for Free and tagged beach, birds, fun, nature, swimming, walks on 2 March 2009 by Micky. Coffs Harbour and surrounding towns have lots of great regular markets, but my favourite one, and the one I would recommend to anyone visiting Coffs Harbour, is the weekly outdoor market held on the foreshores between the Coffs Harbour Yacht Club and the Jetty every Sunday morning. They’re called the Harbourside Markets. Not to be confused with the Jetty Markets, which are held indoors underneath the Jetty Village Shopping Centre. The Harbourside market stalls are set up underneath the trees and the atmosphere is really laid-back. It’s the perfect way to start your Sunday. This entry was posted in Outdoor Activities, Things to do for Free and tagged coffs harbour, food, fun, jetty, markets, music, walks on 18 February 2009 by Micky. Sometimes you feel like a walk on the beach, but other times you like to go somewhere where there are more trees, more birds and there’s more shade. But you don’t always want to make a daytrip out of it by driving to a National Park somewhere. At those times, the Coffs Creek Walk is ideal! The Coffs Creek Walk is right in town but nicely hidden away between the trees, and I can guarantee you’ll feel far away from it all. It’s a real bushwalk through the forested fringes of Coffs Creek, with several boardwalk sections across wetland areas and mangroves. This entry was posted in Outdoor Activities, Things to do for Free and tagged birds, cafés, coffs harbour, nature, restaurants, swimming, views, walks, wildlife on 3 February 2009 by Micky. There’s always something happening in and around Coffs Harbour, but I thought it would be good to give an overview of just the biggest Coffs Harbour events and festivals – the most popular ones that are held every year. For more information on any of these, click on the link to go to the relevant website. This entry was posted in General information, Outdoor Activities, Things to do for Free and tagged art, bellingen, coffs harbour, events, festivals, food, fun, music, sports, what's on on 23 January 2009 by Micky.